Some helpful hints and ideas when traveling that could make your time in The Dominican Republic more enjoyable. I highly advise that you do not drive until you know the ways of the road. Taking public transportation or a taxi is much easier than trying to drive yourself. Morning rush hour traffic crossing the Puente Flotante / Floating Bridge coming into Santo Domingo. Driving is done on the right side of the road. Right turn on red is permitted. 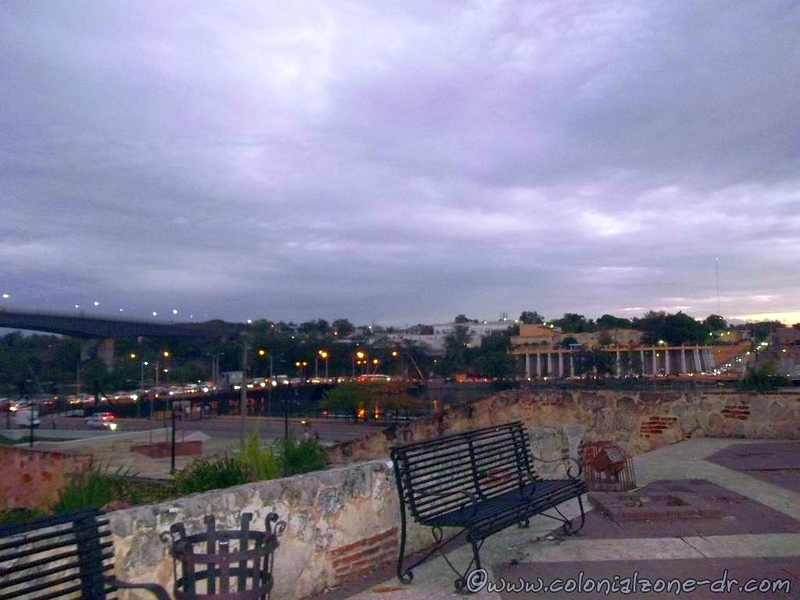 Most Dominicans do not drive at night, especially outside of the city. Most roads are not well lit so you cannot see the obstacles. Many roads are bad. Some are very good then they suddenly will have a giant rut or change in an instant to a dirt road. You must always be alert. Also, headlights do not function the best here. Many cars do not have lights, they do not use lights or they always have the high beams on. Many Motor Cycles do not have lights at all and are very difficult to see. 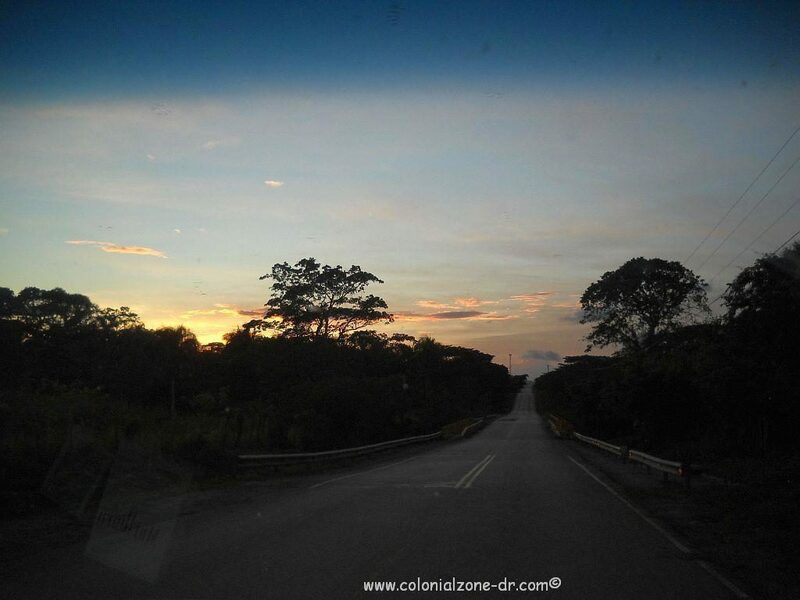 A dark highway without and street lights on the return to Santo Domingo. Fill up the gas tank of your car if you are driving and keep an eye on it, especially if leaving the city or going out at night. Gas stations are few and far between in rural areas. The stations are not self serve. Be alert and keep an eye on the attendants pumping your gas to be sure that no adds-ons are happening to your bill. Many of these attendants are good at deceiving. Some will charge for gas they did not put into your tank giving them a little extra money in their pockets. An unwritten rule of the road. The bigger your vehicle the more rights you have. Little guys get out of the way for the big boys. 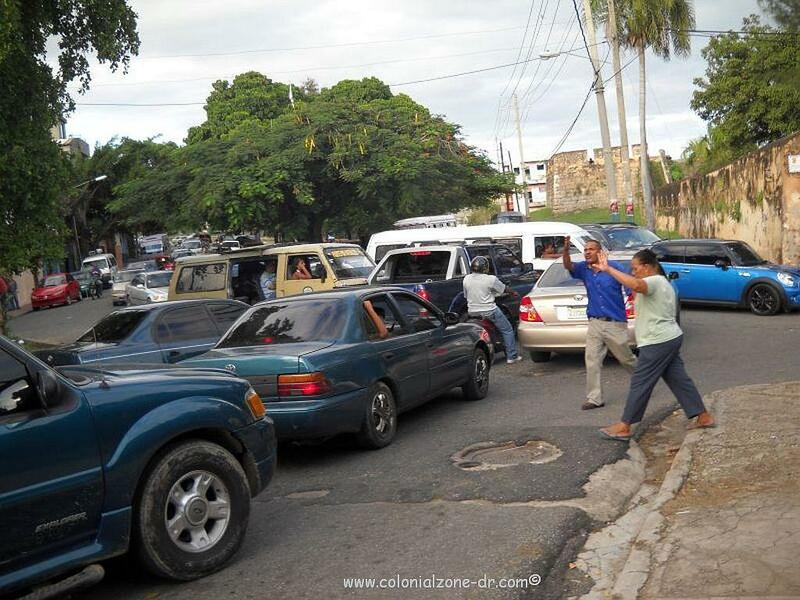 Traffic on the streets of Santo Domingo. Speed limit signs are in KM’s, not miles, so be aware of this. Even if the speed is posted it is not USUALLY enforced. It all just depends on the mood of the officer that day or the officer might need a little extra cash in his pocket. If you are driving keep some change handy in the car. This way you will not have to reach into your pocket to give money. The person that helped you park, the attendant, the passing beggar, the guy that just washed your windshield (even if you did not want it), all want a handout. Also, many of the toll roads are the type where you throw change into the bin. It is always easier to have change handy instead of having to make change at the booth. 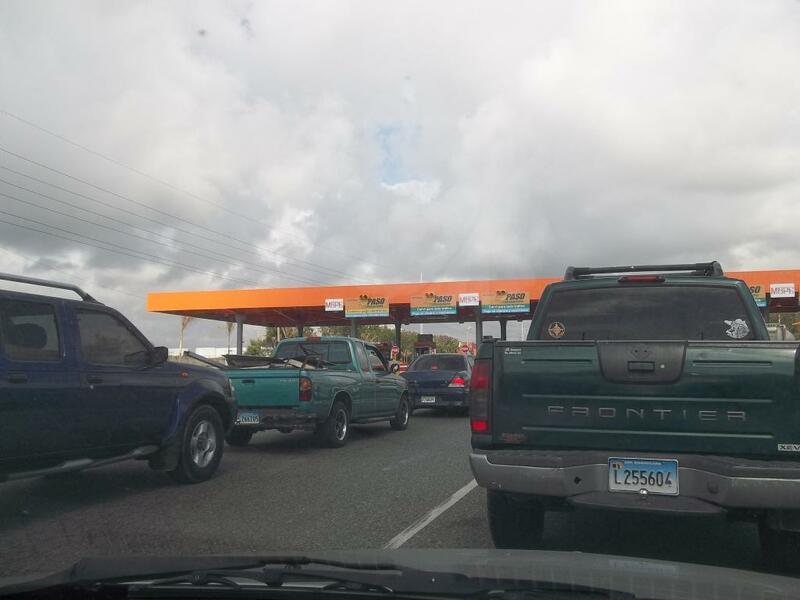 A toll booth in Santo Domingo. Someone most likely will approach you when you park your car. They will offer to watch your car for a price. Give them a small amount and tell them you’ll give them more when you return. This way they MIGHT pay more attention to your vehicle to make sure it is safe in the street. 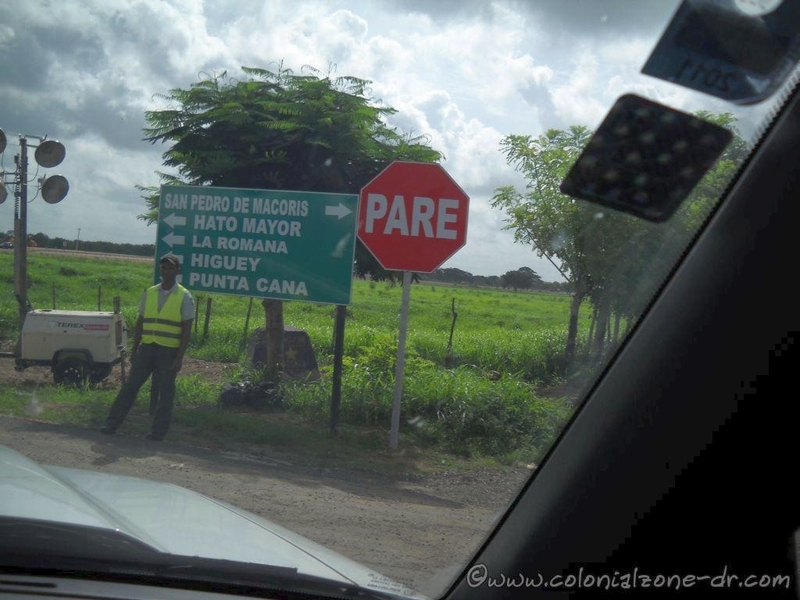 Pare / Stop and other directional road signs on the road to La Romana. 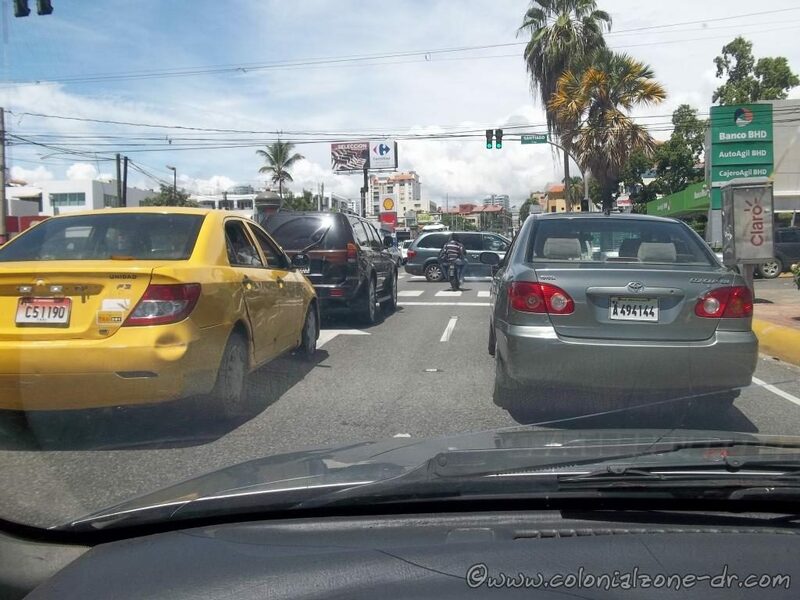 Traffic laws are similar to those in the United States. 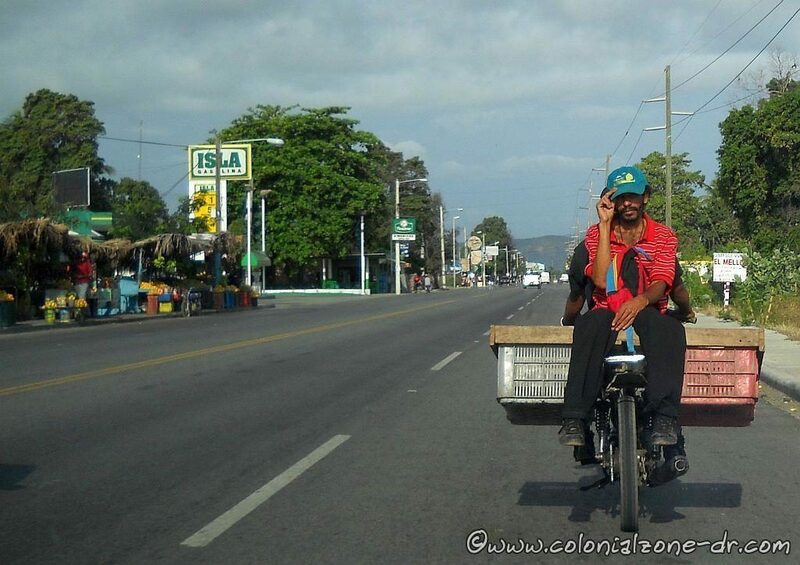 In Dominican Republic drivers, in general, do not pay attention to the driving laws. Turns are made from opposite sides of the roads and turn signals are just pretty lights. Cars are known to stop without any warning and in the center of the road. So when driving always watch closely to what is going on around you. People drive aggressively. They do not yield or give right-of-way. Stop signs (Pare) are a rare sight and even if you do see them not many pay attention to them. *Note: They are starting to watch more for traffic violations. If you have a large violation or crash you could have your car taken or go to jail, even if you are a tourist. Try and practice the word no or better yet the “I don’t see you or hear you” look. If you are not good at either of these make sure your window is wound up when you are at a stoplight. There are many vendors trying to sell items to people at stop lights or any place where cars are stopped on the streets. If you purchase anything be sure to get the item in your hand before you give the cash. There are also beggars at street stops asking for a handout. If you wish to give a little change that’s ok, if not don’t make eye contact or acknowledge their presence. Traffic can be very chaotic on the city streets. Seat belts are the law here. Many laws are not enforced but this law is one of the few that they are very strict about. Using a cell phone while driving..DON’T! This is another thing that WILL get you in trouble if the police see you. Going through a stop sign you might and might not get a ticket. Talking on a cell phone when driving WILL get you a ticket. Use a hands free device. Pedestrians tend to step out into traffic and do not pay attention to cross walks, corners, or traffic signals even though they DO NOT have the right-of-way. People cross everywhere. Even on the busy highways and interstate roads. Be cautious, you do not want to hit someone or even bump into them. Traffic jam in Santa Barbara with pedestrians trying to direct the traffic. 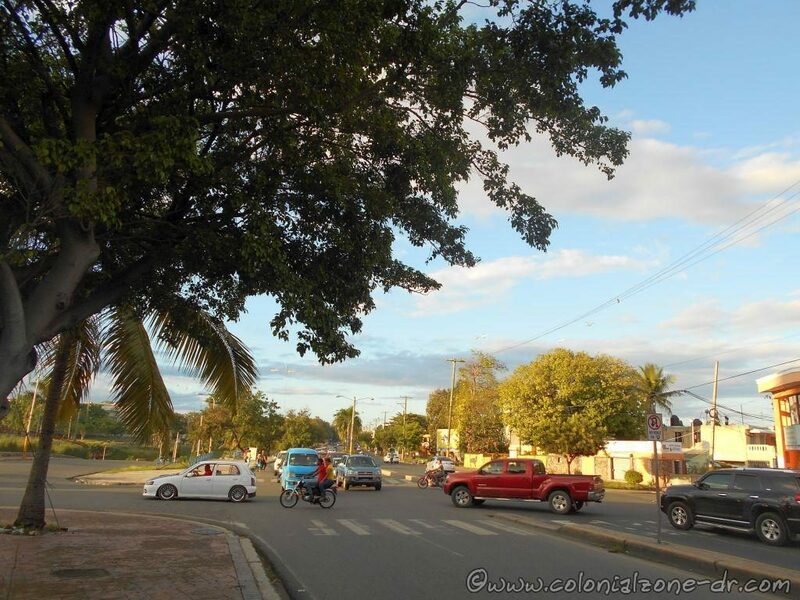 Motorcycles and motor scooters outnumber the cars in the Dominican Republic. The drivers are supposed to wear helmets. Sometimes this law is enforced and other times it is ignored. Motor drivers will work their way through traffic while everyone is stopped at an intersection to get to the front of the line. They drive on the sides of the road and even on sidewalks. Many do not have lights. They drive the wrong way on the roads. This is not true for all motorcycle drivers just most. You need to remember that a motorbike could be anywhere at any time and at any place. Do not leave your purse or belongings on the seat near you if your windows are down. Keep them on the floor between your feet with the strap held or wrapped around your leg. Grab and runs are very common. When talking on your cell phone use caution if the window is down. I know many people that have had their phones torn from their hands while talking from someone in the street or a motorbike passing by. 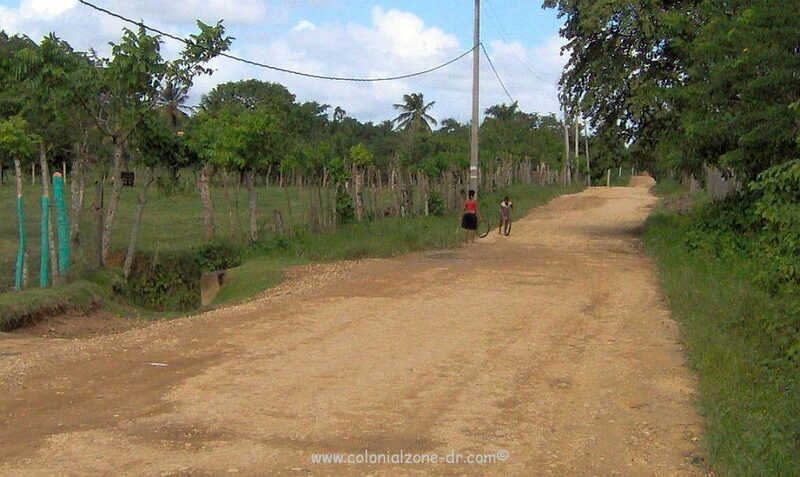 A dirt road in the campo. Little girls are rolling tired down the street. Watch when you open your car door. There may be a motorcycle driver coming up the side of the road. Watch out for Horse carts. They move slow and are found in many of the streets. They also cross in front of cars with no regard for their surroundings. 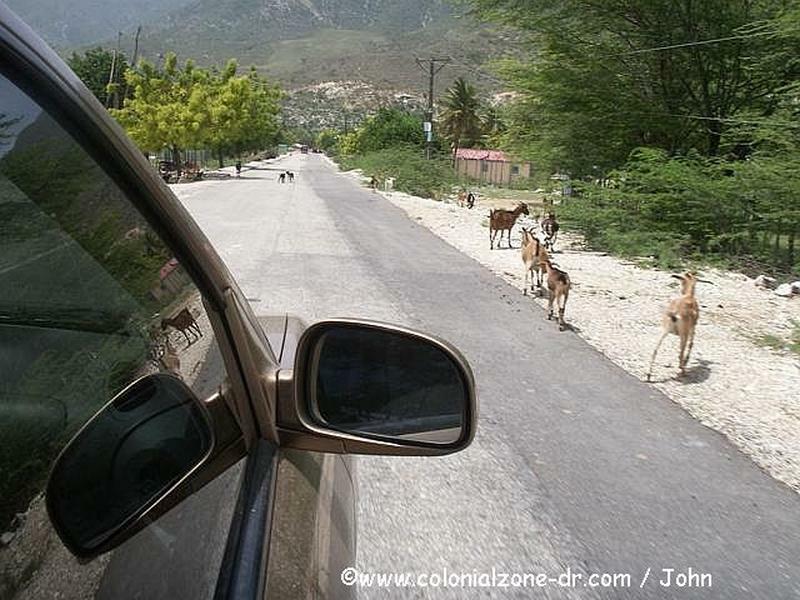 Goats taking a stroll down the street near Lago Enriquillo. 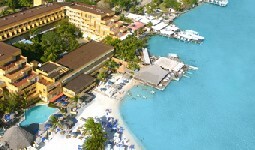 There are no large wild animals in Dominican Republic. No deer or skunks to watch out for in the street. There are goats, horses, pigs and cows that do like to hang out in the streets. Even in the cities. Be aware! 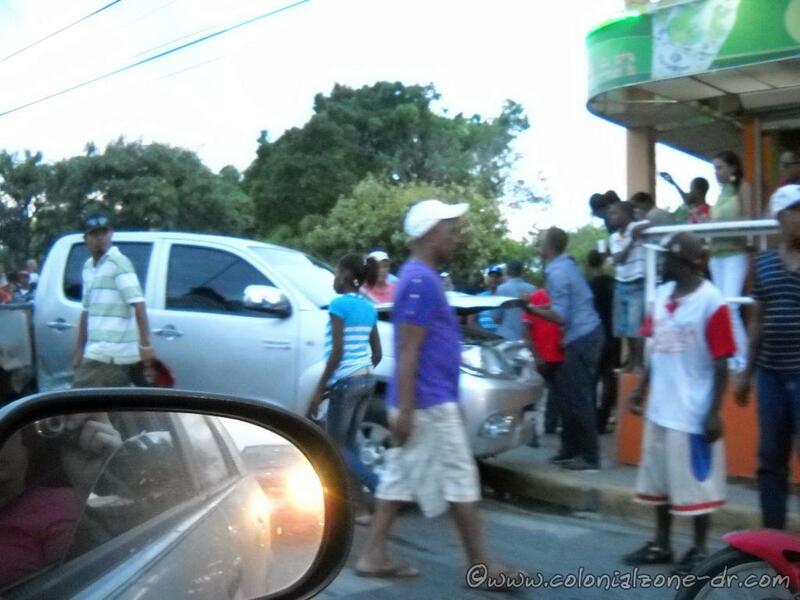 A vehicle crash on the street going to Barahona. People usually gather around to see what is happening. If you do have a wreck try and resolve the incident without police help if possible. Give the other driver some cash and get out of there unless it is a serious crash with injuries. Remember, if you have a wreck you may not be able to leave the island if there are any problems. You could end up in jail until it is resolved. Driving while drinking is not permitted. The country has been cracking down on drinking and driving so be aware. If you are in a wreck or do a traffic no-no drunk you’ll be in big trouble. Even though they say no drinking and driving, many people do and the police really do not pay much attention unless you look like you are doing something wrong or make a mistake. The larger tour busses are quite comfortable and clean. They have air conditioning that can get VERY COLD. Remember to take a jacket or wrap with you. Most likely you will need it. When riding a bus some can get very noisy. Dominicans do like to listen to their music loud and they think everyone likes it that way also. 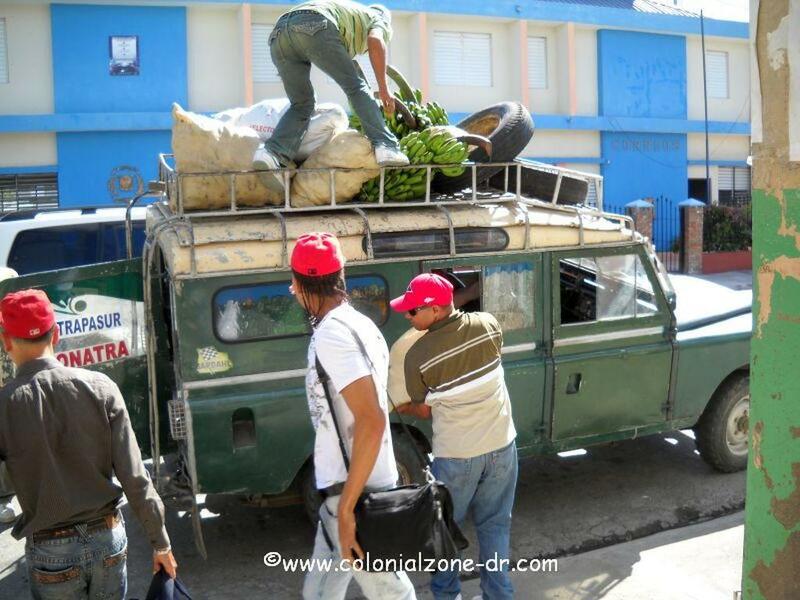 Loading up the guagua from San Jose de Ocoa to Rancho Arriba. When riding a local bus or Guagua they can get loud and are many times dirty and crowded. Many of the smaller guaguas or busses do not have air conditioning so you have to open the windows. They can make many stops along the route. You could even be riding with a box of chickens in the back! So relax and try and enjoy the experience. Nothing much else you can do except getting upset (which does not help) or you can get off the bus. Remember, when stops are made watch for a might-be thief putting his hand into the window to take what you have when you are not paying attention and cannot make chase. It happens often so be aware. Motor transport can come in many forms. Be careful. 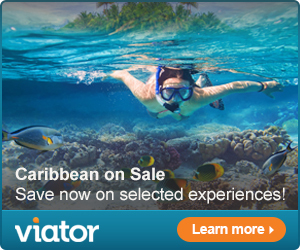 I strongly suggest, especially if you are not familiar with the country, get a taxi or use public transportation. Do Not rent a car to travel around the country. Driving is not easy here. If you get in any type of accident you may not be able to leave the country until it is resolved. Remember, the police do not get paid much money (in general, basic pay can be less than $200 US Dollars a month). This is not enough to raise a family so many of the police do look for tips (regalas). Some spot a tourist and will pull them over and ask for money or they will give you a ticket or take you to jail. It is up to you, but I suggest try not to give money or give a small amount just to get out of the problem. Do not let them see how much money you have. Do not get too aggressive in your argument with them (a little arguing is expected). Many say to make a copy of your drivers license and give this to them instead of the original. Again I suggest, just to be safe, use a taxi. *note- I do not know about the police asking for a tip first hand. This is only what I have been told by other Expats and Dominicans alike. I have never had a problem with this in my years in the country. I do always use a taxi or public transportation. When taking a taxi always ask before hand what the fare will be. This way you can decide then whether to take that car or not. Once you have taken the ride you have no choice but to pay what he asks. I used to make them write down the price so they could not change it later. 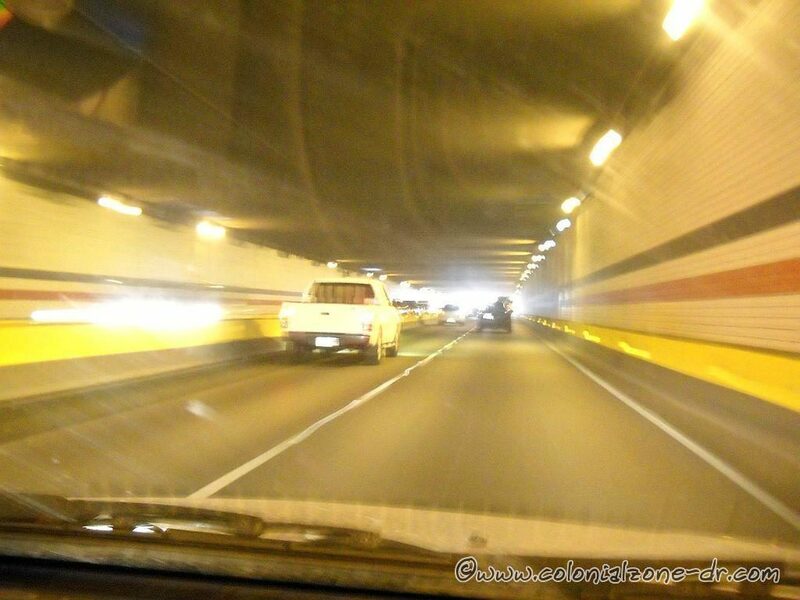 Driving through the tunnel in Santo Domingo. When using public transportation be aware of your surroundings. Watch who is close to you, bumping into you or making loud noises can be to distract you into not paying attention to the hand reaching into your pocket or worse. The Public cars are convenient and inexpensive. I strongly suggest that you do not use Public cars at night. Best to take a taxi. Official registered public cars will have an ID badge in the car with the drivers picture and their identity number. Have the money to pay the driver or bus attendant in your hand or in a convenient place away from your other monies. This way you will not be showing how much money you have to all the passengers. The highway to Miches. Sometimes the road just is not there any longer. Always try and smile and be nice to the driver. Tell them thank you. If possible, in a public car, say the drivers name when speaking to him. This way they know you know who they are. Look in the car first. If you don’t like the look of the driver or passengers (most likely you won’t like the look of the car, but this is normal. Can’t be too choosy with this point) don’t get it. Wait for the next car to pass. The Dominicans do this so you can also. It is better to be safe than sorry. Follow your feelings and instincts. 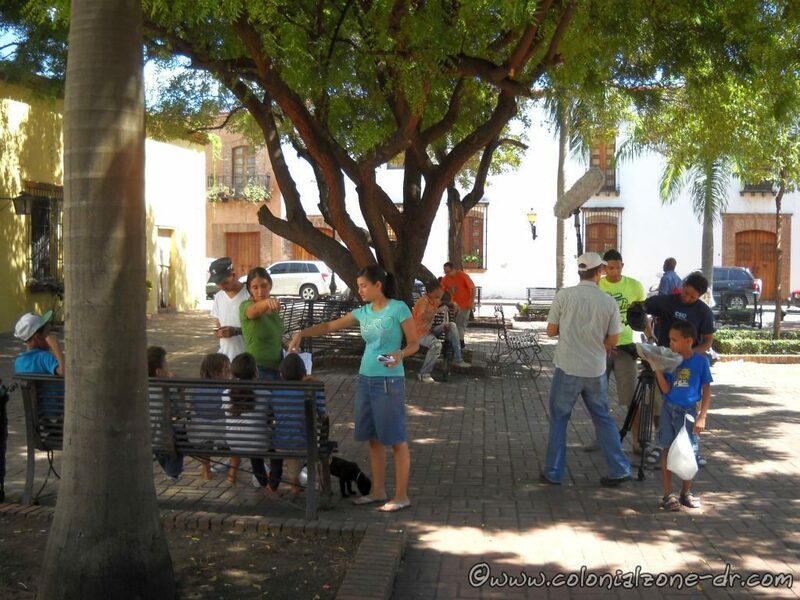 A quick review of how to speak Spanish that could help when visiting any Spanish speaking country including Dominican Republic. I’ve included some of the basic words that you should know, including some public transportation words, the vowels and alphabet and how to pronounce them. These are some of the basic Spanish words that could be very helpful if you are going to visit Dominican Republic (first lesson; República Dominicana is the way to say the name of this country in Spanish) or any Spanish speaking country. 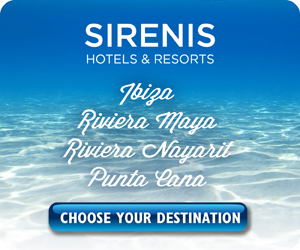 Spanish is not necessary if you are staying at a resort and do not plan to go off the property as most people at the resorts will speak many different languages. Yet, it is still fun to try and use the language of the country where you are visiting. People do appreciate that you tried to speak their native tongue. If you do not pronounce a word accurately or use it in exactly the correct context it is not really important. Also, it never hurts to learn something new and keep the ole brain working. *¿Me ayuda? – Can you help me? *¿Cómo está? – How are you? *¿Habla inglés/español? – Do you speak English/Spanish? *¿Cómo se dice _____ en español?How do you say______ in Spanish? *¿Cómo se llama? – What’s your name? *¿De dónde es? – Where are you from? *¿Qué hora es? – What time is it? *Son las 3 – It is 3 o’clock. *¡Llame al policia! – Call the police! 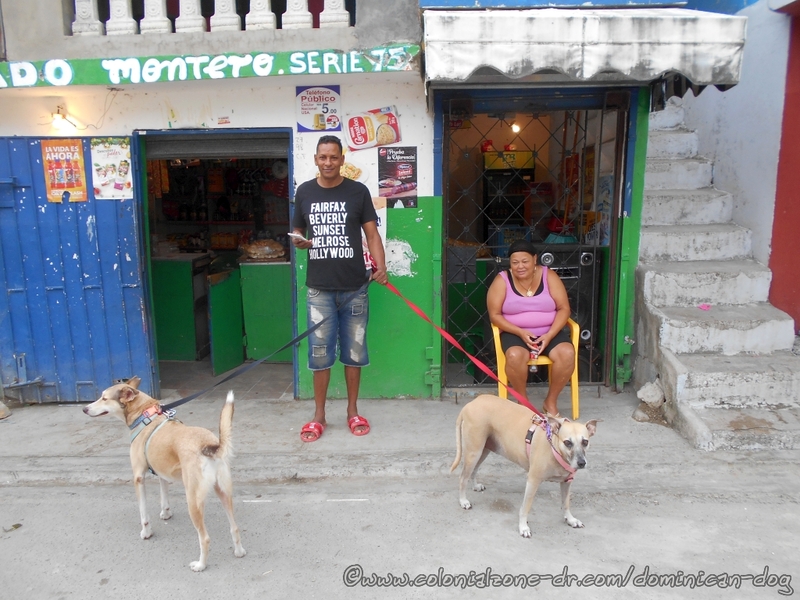 Dominicans in front of a Colmado with the Dominican Dog Blog dogs. When learning about the days and months of the year remember that none of the words are capitalized when you write them. 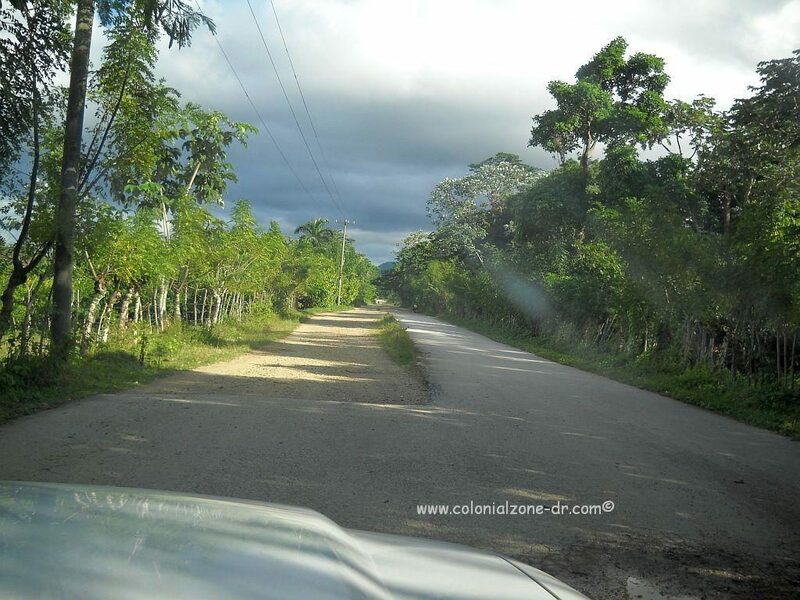 The names of the seasons are good to know when you come to Dominican Republic, even if there is not much difference in the yearly temperatures. There is very little fluctuation in the temperature (unless you go into the mountain areas where it does get cold) but there is a noticeable change in the humidity. Dominican people love talking about the weather even if is only about how hot it is or how much it rained. Public transportation / El transporte público words. These words are good to know if you plan on going out and about to discover the country which you definitely should do. If you cannot remember a word just point. Almost everyone understands a pointed finger as it is a universal way to communicate. Enjoying some free time in one of the local parks. It is very important to learn how the letters of the Spanish alphabet are pronounced. It is the first thing one should learn when trying to speak a new language. The vowels (in bold) are where I would suggest starting. Learning the vowels are the first and the most important step when trying to learn Spanish. Vowels are only pronounced one way, they do not have long and short sounds as in the English language. Since there is only one way to pronounce these letters it makes it much easier to pronounce words when you see them written. The Spanish alphabet has 2 more letters than the English alphabet. Many of the letters are pronounced very differently than what you might be used to. It is a good idea to practice how to spell your name using the Spanish alphabet. Learning the A, B, C’s will really help with hotel check-in. For more Dominican Spanish Quick Guide to Dominican Spanish from Amazon. Did you ever wonder how to type some words in Spanish? Where are those funny letters and symbols? Wonder no longer. You can go into the set up of your computer and change the keyboard to any language you would like but then you have to figure out where all the letters are on the keyboard and that takes time. Here is our suggestion. Make a list of these alt code shortcuts and others you find. Put them where you can find them. I have mine taped to the side of the computer. This way you’ll never be lost again. Also, you will look really intelligent when you type a word in Español and use the proper letter or symbol. For example; to make the Ñ (nne) hold down the ALT key and using the number keypad on the left of the keyboard type in the numbers 165. Let go of the ALT key and you should have Ñ. Remember to hold down the ALT key while you are entering the numbers. When you let go, walah!! You’ve got it. This page list Alt codes for accented letters and other characters. In order to use these codes, your computer keyboard should have a separate numeric keypad on the right (make sure it is unlocked). If it does not, then another method of inputting accents is recommended.